DARPA will launch the second flight test of an unmanned hypersonic glider Thursday (Aug. 11) to test technologies needed for a new global strike bomber concept designed to fly 20 times the speed of sound. The ultra-fast vehicle, called the Falcon Hypersonic Technology Vehicle 2, is slated to launch from Vandenberg Air Force Base in California atop a Minotaur 4 rocket after a one-day delay due to bad weather. Liftoff is set for sometime between 7 a.m. and 1 p.m. PDT (10 a.m to 4 p.m. EDT). The HTV-2 is part of a DARPA plan called Prompt Global Strike. If testing is successful, it could be used as an advanced weapons system whose incredible speed makes it capable of knocking out any target in the world within an hour of launch. DARPA's first Falcon test, HTV-1, did not go as planned. Researchers lost contact with the vehicle nine minutes into the first flight test in April 2010, and failsafe programming caused the Falcon HTV-2 to make a controlled dive into the ocean. Researchers are hoping to push the vehicle further and gather more data with this subsequent test. A Minotaur 4 rocket stands beside Space Launch Complex-8 here Wednesday, Aug. 3, 2011. 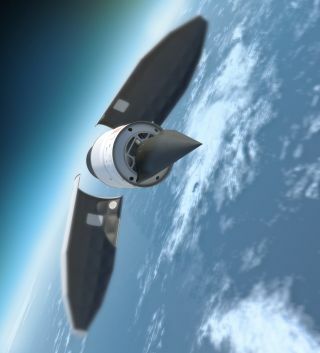 The Minotaur 4 will carry DARPA's hypersonic HTV-2 aircraft scheduled to launch from California's Vandenberg Air Force Base in August 2011. Some changes include an adjusted center of gravity and lower angle of attack (angle at which the vehicle hits the air). A Minotaur rocket will launch the HTV-2 nearly into Earth orbit, then the HTV-2 will detach and follow a glide trajectory at Mach 20. More than 20 sensors will collect data during the flight. The HTV-2 could replace the current intercontinental ballistic missile systems. There were only two HTV-2 prototypes built and DARPA has no plans to build more, so after the failure of the first test, DARPA has only one more shot at a successful flight or the project will be discontinued. Dan Hope is a staff writer for TechNewsDaily, a sister site to InnovationNewsDaily and SPACE.com. Follow InnovationNewsDaily on Twitter @News_Innovation, or on Facebook.